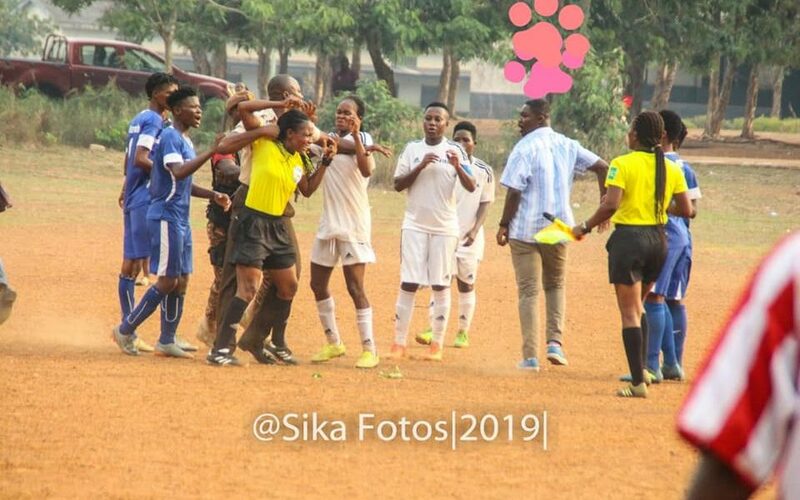 Referee Theresa Bremansu suffered attack from fans during the NC Women’s Special competition between Prison Ladies and Ampem Darkoa Ladies. The centre referee was assaulted by fans believed to be from the camp of Prison Ladies after the game. Bremansu, a FIFA referee was allegedly beaten by the said fans who were not pleased with officiating after their side lost 1-0. Reports say, the referee was slapped by a fan from behind and was mishandled. It however took some few security personnel available to save the match official from her “enemies”. Venue Media officer, Akosua Frimpomaa also confirmed the incident. ”Referee Theresa Bremansu was attacked by a guy many people say he is a prison officer. He slapped the referee from behind,” she narrated. The Disciplinary Committee is expected to look into the matter and take the necessary action after receiving the report from the Match commissioner.